Dropped off a high desert basilik in Sunderock Springs. Had two of these drop in 10 kills of Chetari in the Dragon Necropolis. 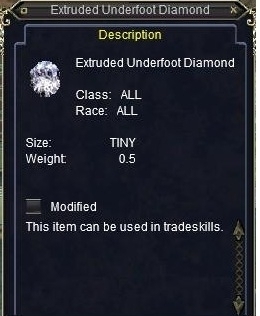 This just have dropped from "a gorilla brute" in Zhisza, the Shissar Sanctuary. One just dropped off of a Bloodmoon Warlock in Loping Plains too. As mentioned before, the stats modified depend on the cut. Adding a round cut opal (+120 hp in this setting at lvl 65) and a round cut emerald (+120 mana/endur) gives you a piece with 20 ac, 508 hp/mana/endur, 20 to 5 stats and all resists (except corruption) and room for one more aug. A melee would probably swap out the mana aug for an AC aug, round cut peridot. Drops in Oceangreen Village also. Dropped off one of the animals. One dropped in Temple of Bertoxx off a Putrid servant. Drops in Loping plains of "a restless alligator"
It dropped from a rock consuming goo in the cooling chamber. I found one in Precipice of War: Studying the Portal on a kyv or noc model. I can't remember which. a volcanic drake in Ashengate. Yeah, it definitely seems like a global drop from upper level zones. dropped off "a Sunstone Reaver" in Buried Sea zone. Very rare though it seems. Dropped of a Shissar Herb Tender while doing the Herb quest. I have seen this drop in OGH from an infected gray wolf, also in Toskirakk from various trash mobs. Safe to say it can drop drom virtually anything. has its advantages in finding recipes. Was cleaning up mob corpses after afkers in PAW and found one on one of the elementals. Not sure which one but they pretty much all have the same loot table. Dropped in Ashengate off one of the stone guardians. Haven't seen any since in a couple days but then again Ashen isn't known for their gem drops.